Ah, so you want to become an evil genius, do you? It's not entirely hard to do. In fact, it's incredibly easy, as long as you follow ALL of these steps below. You'll be on your way to taking over the world in no time. This is a given. Minimum IQ of 140 is a must. If we are going to be realistic however, an IQ of 160 is almost a necessity. Should you only have an IQ of 110, but you have a ton of ruthless ambition, and legions of loyal minions to do your bidding.... Well you can just return from whence you came, don't let the door hit you on the way out, and find yourself a job befitting of one such as yourself. Perhaps a cleaner of toilets or some such. Leave the Evil Geniusing to the actual genius' please. In order to become an evil genius, you need a reason to do so. Many evil geniuses were picked on in school, had abusive siblings, or a grandfather with an interesting take on ancient Chinese ancestor worship. In many cases, this leads to a lust for power. For normal people this would involve becoming the head of a homeowner's association and lording over your neighbors, or getting yourself in charge of the family Christmas and creating a seating chart for all of the 40-year-olds that need to be told where to sit. But you aren't trying to become a normal person, are you? You need to boss around minions to do your every whim and die in your name, not white-collar 9-to-5ers who are already dead on the inside. Always remember not to go too far in giving yourself a deformity. 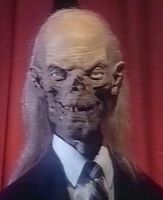 The Cryptkeeper is a constant warning of what can go wrong. Never Forget! Many evil geniuses have deformities of all kinds. Deformities of the face or hands are not uncommon. If you don't already have one, you may want to give yourself a deformity of sorts. (And don't go with one of those lesser deformities or anything. Having a lazy eye looks stupid, but not so stupid that you can hang your evil hat on it.) It will make you much more terrifying. Something like an electronic eye, or hand made of blades will do. They can also be functional, as you can customize your spinning blade hand with a little water sprayer, and Voilà!! Instant way to break the heat! Parading around in your evil genius form whilst still being called your normal name is a BIG no-no. No one is ever going to remember the evil genius called "Jim Reynolds," now are they? Naming your alter-ego should be both creative and fun. But if you are having problems, there are always good places to start from. Have you already given yourself a deformity? Good. A great method to name yourself is to base it around that deformity. Dr. Pink-eye, Grandmaster 4-Fingers, General Lobotomy are just some of the great ideas that we're just giving away! Oh, sure, you could name yourself something easy like Dr. Evil or Mr. Sinister, but you're getting into this business to be remembered. A unique, memorable name is the number one way to be both remembered and feared. Your friendly, neighborhood Evil Lair! Now it's time to pick your evil lair. Your evil lair should reflect your personality. For instance, if you are easily angered, how about something unstable, like a volcano. Animal lover? The rainforest might just be the secluded, treacherous locale you are looking for. Hate being tied in one place, and love aquatics? Buy yourself a submarine! Don't have the money for it? Put it on your credit card, and... "Pay it off later." Look, you didn't get into the evil genius business to improve your credit score. Or, if you're worried about that kind of thing, you could just kill the guy you bought it from. Really, the choice is yours. Go crazy! Buy a private island and build your own personal robot army. Anatomical correctness of said robot army is up to your discretion. A Henchman is something you'll need to carry out sticky assignments like assassinations and recording the football game on Sunday. They should be unpredictable, able to turn the average man into nothing more than a red smear on the sidewalk, and prone to violent outbursts at a moment's notice. Also, they too should have weird deformities. You've already given yourself a weird deformity, if you don't find a henchman even more hideous than you, people might start to talk. Now, you could always go with a classic henchman, like Igor, but it's a little bland and predictable. You don't want everyone to think you are a copycat Evil Genius, now do you? Your henchmen should definitely have a theme. Something like, clowns that have crocodile teeth surgically implanted into their mouths, Astronauts wearing party hats, or bulky Eastern European women dressed in cheerleader outfits. Anything really. As long as there is a theme in place, no one at the Evil Genius convention will laugh at your lack of style or flair. And keep your henchmen in line for God's sake. You don't want this to be like the time Sergent Cancer-foot was laughed out of the convention when his lead henchman was caught wearing a mismatched pair of socks, now do you?! As stated already, to ignore the high fashion of the day is a mistake many a starting-out-Evil-Genius can make. Every Evil Genius must be style conscious, and have the right look. Nehru collar suits or jackets are always a winner as are your basic robo-exoskeleton. If you are an Evil Genius who sometimes appears in respectable circles (such as Board meetings of your fictitious multinational business front company or giving speeches to the UN) you will also need a nice British tailored three piece suit with power tie. Cyborg body replacement parts are a nice power accessory. Simple metal claws are very old school, but robotic hands, laser monocles, or bionic limbs will wow all of your Evil Genius colleagues at the next EvilCon. Facial Hair: Goatees, van Dyke Beards, those tiny Mustaches (See Lenin or Hitler), and those crazy, long French mustaches (see Captain Hook). Antique Eye Wear: You cannot go wrong with a monocle or pinz-nez. Jewelery: ALWAYS a no-no unless it is a pocket watch, a necklace holding a computer chip, or a power-granting amulet that the hero must never be allowed to take. Alright, you got it? Motive, check. Deformities, check. Catchy name, check. Evil Lair, check. Henchmen, check. Now beware of your archenemy that is sure to start thwarting your every move in due time. Be sure to keep him around. Yes, you could kill him at any moment, but who would be there to gloat to that you are more intelligent, and better in every way than? The truth of the matter is that the press doesn't pay attention to Evil Genius' without archenemies. The sad fact is that you need him just as much as he needs you. IF he needs to be killed, make sure to do it in the most theatrical way possible. That way, your name will go down in infamy as the Evil Genius who finally did his archenemy in, and you were unique about it. If it isn't one-of-a-kind, what is it? Just a sad deformed person with a gun shooting a rather decent bloke. And that's the kind of thing that get's your story on page 15 of the local paper, not page one of the Washington Post. This page was last edited on 22 December 2014, at 20:37.